In the Week 18 edition of fantasy baseball 3×3, we’re rejoicing in the return of Collin McHugh, setting realistic expectations for Chris Tillman, and giving Christian Yelich his due. There are plenty of waiver wire columns out there that provide an exhaustive list of the most added players in fantasy leagues. This isn’t one of them. Here, we’ll run down a few of the most interesting players for fantasy owners, with perspective on who deserves a your attention, who deserves your patience, and who deserves to go straight to bed without dessert. Any questions, thoughts, trade deadline predictions? Hit me in the comments or on Twitter. Collin McHugh’s curveball is a thing of beauty, but it’s not just pretty, it’s arguably the most effective curve in the game. 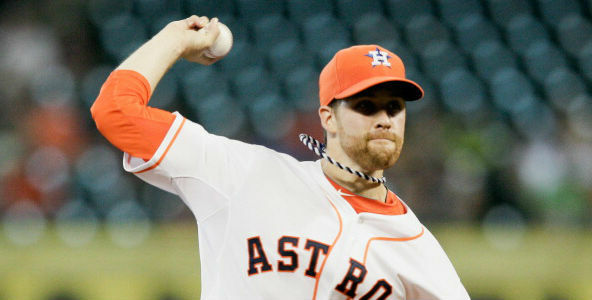 Only Adam Wainwright and Jesse Hahn can rival McHugh’s bender in terms of movement and bat-missing ability. He spots it well and it’s absolutely untouchable down in the zone. I’m just so glad to have him back. He was due for a bit of home run regression and although I didn’t expect it to hit so hard in his first outing back, I’m fine with resetting expectations just a bit. I do believe that McHugh will outperform the 4.94 and 4.29 ERAs projected by ZiPS and Steamer, respectively; I expect he’ll maintain something closer to his 3.63 FIP. Regardless, the strikeouts are not going anywhere. McHugh remains among the best in the league when it comes to missing bats and as long as that curveball is still around, that’s not likely to change. For his career, Chase Headley is a .286/.360/.444 hitter on the road. Since 2007, only six third basemen with as many at bats can outpace his .804 OPS. By wOBA, he’s been a better hitter on the road than Ryan Zimmerman, Kyle Seager, Aramis Ramirez, and Todd Frazier. With numbers like that, you’d think he would have been scooped up just about everywhere after his trade to the Yankees, but he’s still out there in more than half of Yahoo! leagues, perhaps because his road numbers have been a bit less impressive since 2012. The downward trend is undeniable, but it’s not as though there’s some unconquerable demon at the center of it. Headley’s been banged up during both of the last two seasons, which certainly hasn’t helped, but his plate discipline and batted ball rates on the road haven’t changed significantly, nor has his overall batted ball distance, save for the gigantic spike in 2012. 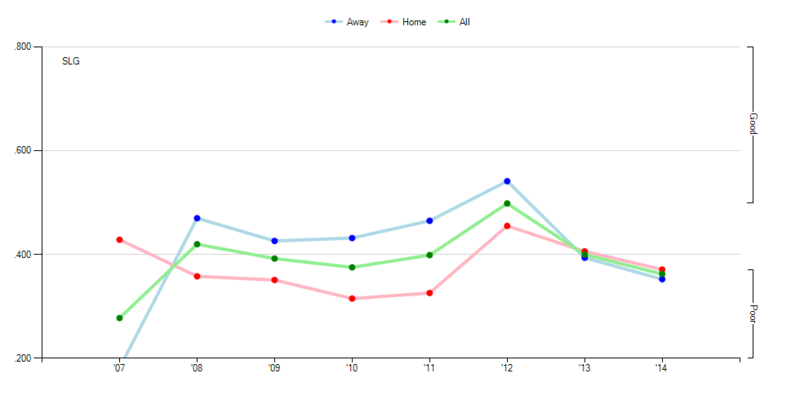 Tony Blengino profiled Headley’s decline in tremendous detail over at FanGraphs and I can’t disagree with his assertion that Headley will never again reach the peak he set in 2012. 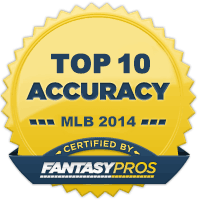 That, however, does not mean that he can’t contribute solid fantasy value as a Yankee. He’s not doomed to live out the rest of his days hitting as though he’s still playing in Petco. If the trade doesn’t rejuvenate him, hitting in Yankee Stadium certainly will. In 2011, Mark Teixeira hit 37 bombs with a batted ball distance less than a foot shorter than Headley’s. Last season, Robinson Cano hit 27 homers with a batted ball distance just about a foot longer than Headley’s. Headley popped his first home run as a Yankee on Sunday and ZiPS projects him for seven homers the rest of the way; with favorable winds, I wouldn’t be surprised to see him hit one or two more than that. As of Saturday, George Springer wasn’t doing any exercises on his injured quad. It’s crappy news for owners of one of the most exciting young players in the game, but Springer’s injury has kicked a door wide open for Chris Carter, who has slid into the everyday DH job and the cleanup spot in the batting order. I bet when Carter ends up in jail in Monopoly, he just rolls the dice forever and ever, always completely confident that those doubles are coming up on the next roll. From what I can glean from watching his approach at the plate, I’m pretty sure that must be true. Carter cuts at just about everything, knowing that eventually he’ll run into something; only Springer has swung and missed more often this season. It requires quite a lot of confidence to keep taking such voracious cuts in the face of so much failure, but Carter reaffirms his faith in himself every time he makes contact. Baseballs go a very long way. Carter is a horribly flawed player, but he can be incredibly useful in the right situation, especially given his dual eligibility. He’ll be hard pressed to hit .230 the rest of the way, but he’s got as good a chance as anybody to slug 15 homers in August and September. Now that he’s got a line on regular at bats, Carter can be a savior for power-challenged fantasy owners. Chris Tillman is the prettiest girl in school. From a distance, he’s pretty, tossing more fourseam fastballs than any other pitcher and featuring a yakker that I’d hang on my wall if making watercolors of animated GIFs was possible. He follows a the tried-and-true approach of changing a hitter’s eye level, first establishing his heater up in the zone, then burying his curveball and changeup. When it works, there may not be a more aesthetically pleasing pitcher in the game. Unfortunately, it hasn’t worked particularly well this season. Apparently, the prettiest girl in school doesn’t have much to say when you actually get her to go out with you. 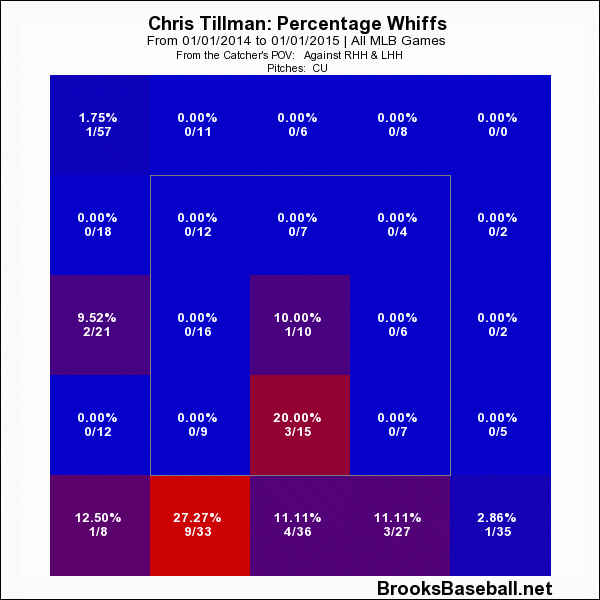 He can change the eye level up-and-down, but Tillman doesn’t have anything that moves sideways; only his changeup has more than three inches of horizontal movement and the 4.72 inches of arm-side run he gets on that pitch ranks among the league’s worst. Without anything that runs away or bores in on opposing hitters, Tillman has to rely heavily on coaxing hitters into chasing his curve outside the zone or buckling their knees for called strikes. He hasn’t been particularly good at either this season. 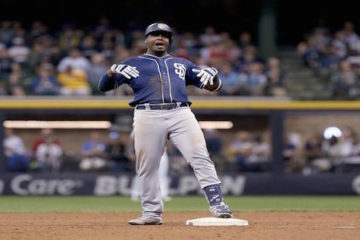 While his bender is one of only four in baseball to feature more than ten inches of vertical drop, Tillman’s curve has the 14th-worst swing rate, 34th-worst whiff rate, and the sixth-worst strike-to-ball ratio of the 122 pitchers who’ve thrown at least 100 curveballs this season. It’s a spectacular pitch, but it lacks deception. Tillman continues to bury it down in the zone, but the fish just aren’t biting. 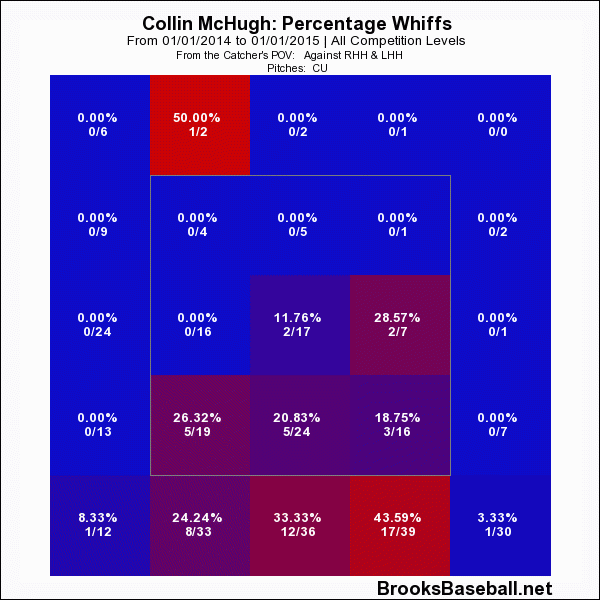 Those whiff rates may not look terrible at first, but compare it to Colin McHugh’s zone profile above; the difference is startling. Without the ability to tempt opposing hitters with his curve, Tillman’s walk rate has risen to its worst level since 2010. The only thing keeping his ERA below 4.00 has been his ability to limit home runs, but if his past in any indication, that won’t stick around much longer. His current .89 HR/9 rate and 7.9% HR/FB rate are both well below his career averages and without any appreciable change in pitch mix or approach, I don’t see any reason to project these improvements to hold. ZiPS projects him for an ERA in the 4.20 range and a strikeout rate just barely above average over the rest of the season; that feels just about right to me. In mixed leagues, there’s surely a better option available on your waiver wire. 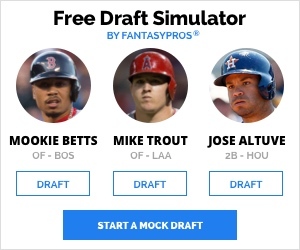 If you play in two-catcher leagues, I’m sure you’ve been tempted. I’m sure you’ve looked back at the 27 bombs that A.J. Pierzynski slugged just a couple of years ago, or at the 17 homers he hit last year. You thought twice about a guy who hasn’t played in the National League since 2004 and has now fallen into something close to an everyday job on a very good team. Don’t do it. It’s not going to go well. Don’t trust that a 37-year old catcher who swings at nearly half of pitches outside the strike zone will continue putting up the best power numbers of his career. Pierzynski hit a combined 44 home runs over the last two seasons. Over the 11 full big league seasons he’d played before then, he’d only amassed more than 44 homers once in a three season stretch! Any bump in production you could have possibly hoped for from a move to the National League should be wiped out by the move to Busch Stadium. Pierzynski hasn’t played his home games in a pitcher’s park since 2004; he never hit more than 11 homers in a single season while playing for the Giants and Twins. So that means that if you’re picking up Pierzynski, you’re counting on a free-swinging catcher who’s pushing 40 to ride the second-highest groundball rate of his career to a solid batting average. Good luck with that. This recommendation has absolutely nothing to do with the Joakim Soria’s ability as a pitcher, nor does it have anything to do with the unfounded rumors that FX’s hit series The Strain is actually about whatever malady infects formerly solid relief pitchers when they join the Detroit Tigers. This is all about Joe Nathan, who, barring some unforeseen change of heart from Brad Ausmus, is going to remain the closer for the Detroit Tigers. Ausmus will use Soria to close on occasion, but for the most part, he’s going to pitch in the seventh inning. And I completely believe him. Ausmus had a chance to replace Nathan with the reinvigorated Joba Chamberlain earlier this season and passed it up. Hell, if Nathan’s first outing with Soria in the fold is any indication, he may not have much reason to consider another change anyway. Nathan threw 12 pitches and registered six (SIX!) swinging strikes in nailing down his 21st save of the season. His slider had more life than I’ve seen all year. This wasn’t just an adrenaline rush (his fastball velocity, both average and maximum, was right in line with his season average), it was just improved command and sequencing of pitches. The adjustment Nathan made to drop his arm angle seems to be sticking, which bodes well for his fantasy future, and poorly for Soria’s. The erstwhile Rangers closer is droppable in all formats. 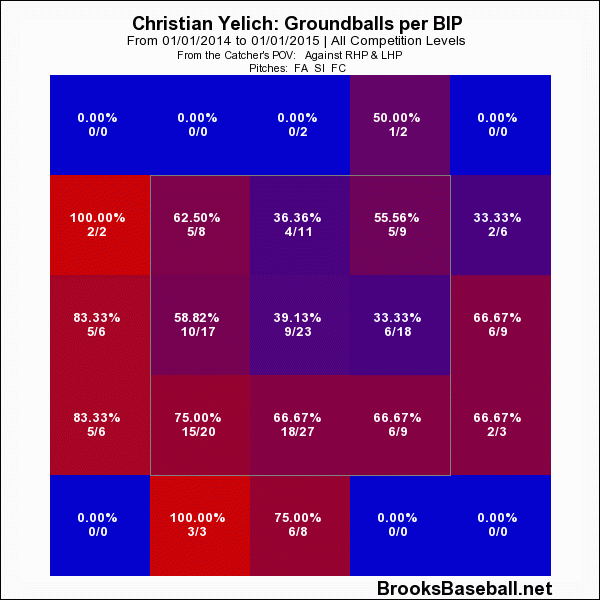 Man, was I wrong about Christian Yelich. What I thought was evidence of an inability to drive the ball in the air is actually the mark of an exceptionally intelligent hitter. I’m still not crazy about the fact that he sports the sixth-highest groundball rate in baseball, but I can accept it now that I have a better understanding of his approach at the plate. 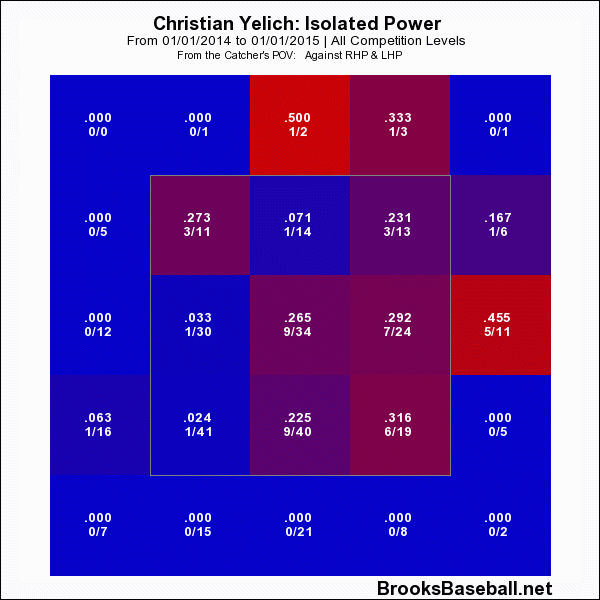 Yelich has good, not great, power and good, not great, speed. He’s developed a hitting strategy that uses each skill to its fullest. When Yelich sees a pitch away, especially a heater, he’s smart enough not to try to pull it. He’ll just slap it on the ground and happily take his base hit. Similarly, when pitchers challenge Yelich with a pitch inside, he’s got the bat speed to hammer it. He shows excellent power to right and center; each of his eight home runs has travelled at least 400 feet. At only 22 years old, Yelich is showing smarts and patience beyond his years. His future is blindingly bright; he’s already showing improvement this year in his willingness to pull offspeed stuff and elevate hard stuff. He’ll be great down the stretch in redraft leagues and is a fantastic trade target in keeper formats. Danny Salazar is back. Well, it’s probably a little bit too soon to say he’s BACK, but he’s definitely back. He carved up the Kansas City Royals with a fastball that showed really impressive late life. His velocity isn’t quite what it was last season (the gun in Kansas City tends to run a little hot), but he’s been effective since returning from his head-clearing journey down to Triple-A. In two starts in the big leagues, Salazar has fanned 13 batters in 12 innings with a 4:1 strikeout to walk ratio, something he hadn’t done in any two-start stretch in April or May. Most importantly, he hasn’t allowed a home run after serving up eight homers in his first eight starts. Landon Jones primed the pump for Salazar’s comeback a couple of weeks ago and warned that a loss of good will shouldn’t lead to ignorance. Yes, Salazar burned a lot of fantasy owners this year, but the ceiling he showed last August and September still exists. Salazar joined the Cleveland rotation full-time on August 8. 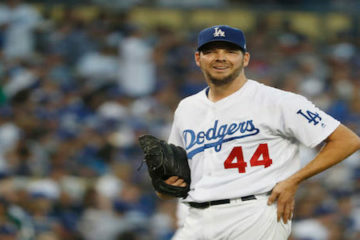 In his ten starts over the rest of the season, he fanned 58 batters in only 46 innings. In September, only four starters had a better strikeout rate than Salazar’s 31.4%. Who’s to say he can’t replicate that this season? I’m going to cheat a little bit and lump these two guys together, because my advice is exactly the same for both: don’t get squirrely. They might get traded, they might not. They might end up in a hitter’s park, they might end up in a pitcher’s park. Losing one of them in an AL-only league would be an absolute disaster, but selling for 50 cents on the dollar before they don’t get traded would be worse. It’s going be a bit nervy, but hang tight. Whatever happens is going to happen, the highest upside play you can make is to hold on to these valuable assets. Gerard writes words about baseball and football for The Fantasy Fix. His turn-ons are post-hype sleepers, high-K relief pitchers, and the Oxford comma. Follow him on Twitter @gerardowrites. Would you still drop Duda to add Carter after Duda’s last seven days? If your primary need is home runs, yes, I would. Carter is a more limited player overall, but he’s a better bet to produce big power numbers quickly. What up Michael Cuddyer aka cuddles? Are you familiar with his work? Replacing Soria, who do I pick up: Cassila, Felix, Meija, Benoit, or Rondon? First off, I must say I really enjoyed reading your article! You went into a great amount of depth and cited credible statistics to back up your claims. A very good read that I will be recommending to others looking for knowledgable fantasy advice. I have a couple of questions for you. What’s your view on Jhonny Peralta, Mark Trumbo, Conor Gillaspie, Marcell Ozuna, and Matt Holliday? I know that’s somewhat of a lot of players to give your advice on, but it doesn’t have to be in-depth. Basically, my situation is that while these players are somewhat producing currently, their inconsistency in various areas are hampering my team overall (and I’m currently in 2nd place in my league and only a few points back of 1st place). So essentially, would you recommend keeping them (or some) down the stretch or looking for other viable options via free agency and/or trades? Also, just for reference, there seems to be some viable candidates in free agency, but I’m just not sure if it’s the smart play to do so. Thanks John, I very much appreciate it! On your question, it depends on where you can make up points. At this point in the season, it’s really not about evaluating which players can contribute the most overall, it’s about which players can fill the specific roles that can generate the most value for your team. I’m generally pretty positive on guys like Peralta, Trumbo, and Ozuna, but their contributions are mostly in the power/run production department, if you need batting average or speed, they won’t be much help. Holliday, I’m not so positive on. He’s been in a pretty steady decline in recent years; unless you really need the batting average he can provide, I’d look to deal him. His name is worth more than his production at this point. I can’t say for sure without knowing the depth of your league, but you can probably get somebody with more upside than Conor Gillaspie. Will Middlebrooks is back up with the Red Sox, he might be a good fit if he’s available. I hope that helps – I’m happy to answer more if you’ve got any other specific questions. expensive to put right. Will they go over the instructions with you when they are done.